A sky-view camera affixed to Nicholas Rajkovich's bicycle-based weather station captured an image every minute during each of his 12 rides through the Cleveland area in summer 2012. It's part of Rajkovich's climate resilience research. Nicholas Rajkovich, assistant professor of architecture at the University at Buffalo, tests out his bicycle-based weather station. Nicholas Rajkovich, assistant professor of architecture at UB, designed and built his bicycle-based weather station in conjunction with the University of Michigan, from which he received his PhD. BUFFALO, N.Y. — It’s a bizarre scene: a man on a cargo bike tricked out with lots of strange-looking equipment labors up and down the streets of Cleveland and surrounding suburbs. University at Buffalo architect Nicholas Rajkovich received more than a few looks of disbelief while riding his bicycle weather station through northern Ohio a few summers ago. That’s OK. He’s hoping to turn heads with the data this unique contraption allowed him to gather. Rajkovich designed and built his bicycle-based weather station to compile microclimate data, such as solar radiation, sky view, surface temperature and air temperature. “To the best of our knowledge, this is the first time anyone has installed a research-grade weather station on a bicycle to gather this much data for analysis,” said Rajkovich, an assistant professor of architecture in the UB School of Architecture and Planning. “Although airport weather stations and satellite data help to estimate temperatures in a city, finer-scale data is needed to support planning at the neighborhood level,” he added. This granular level of information helps explain how things like tree cover contribute to variations in ground and air temperatures in different neighborhoods within an urban area. It will help urban planners and policy makers develop neighborhood-level programs that can mitigate the impact of climate change on cities and their residents. Rajkovich used a cargo bicycle for its heavier frame and enhanced stability while carrying a large load. The equipment weighs approximately 50 pounds. He affixed a thermocouple unit, a hygrometer unit and a GPS device to a 6 ½ foot tall aluminum tower positioned on the back of the bicycle to avoid ground interference. The bike was also equipped with a camera, a four-component net radiometer and an infrared radiometer. Readings were taken every second; a data logger averaged the measurements for each minute, storing the information on an onboard hard drive. He took 12 rides during the summer of 2012 – each during the hottest part of the day, typically late afternoon – on bicycle paths maintained by Cleveland Metroparks and the Cuyahoga Valley National Park. “In itself, the method was kind of an experiment. It was fun using a bicycle to do this research. It was a good workout, too,” said Rajkovich. The bike piqued plenty of interest along Rajkovich’s travels. At one point when he stopped to take a break, a family of four rode up on their bicycles and asked Rajkovich about what he was doing. “After a pleasant conversation, they wished me luck with the project and started again on their way. As they rode away, one of the children asked their parents why I just didn’t watch the TV to understand how warm it was outside. I thought that was pretty funny,” Rajkovich said. 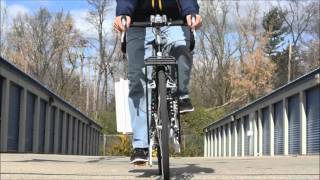 Rajkovich developed his bicycle weather station as a PhD candidate at the University of Michigan and tested it in Cuyahoga County, Ohio, in the summer of 2012. His findings were published this January in the International Journal of Environmental Research and Public Health in an article co-authored with Larissa Larsen, associate professor of urban and regional planning and natural resources at the University of Michigan. An urban heat island is a built-up area that is hotter than the surrounding rural areas due to human activity. Urban heat islands pose greater public health risks because they contribute to increased electrical demand associated with air conditioning and increase ground-level smog. The data Rajkovich’s mobile weather station can collect can help drive decisions on preventative programs, such as cooling centers or tree-planting initiatives. The City of Cleveland is using the data, in part, to help target their urban tree-planting program. Cuyahoga County served as a good test region because of its susceptibility to high temperatures due to a large number of impervious surfaces and a lack of tree cover. And while Lake Erie provides a cooling effect in the summer, heat waves across the Midwest have risen over the past six decades, Rajkovich points out, noting that humidity is projected to increase in Cuyahoga County in the coming years. Plans aren’t finalized yet, but Rajkovich may use the bicycle again this summer to collect data in Buffalo or Cleveland. As part of their body of work on climate resilience, Rajkovich and his team of UB graduate students received funding from the Kresge Foundation to develop climate resilience strategies for Cleveland and other at-risk urban areas. The Kresge Foundation’s $8 million Climate Resilience and Urban Opportunity Initiative aims to bolster the capacity of community-based, nonprofit groups to influence local and regional climate resilience planning, policy development and implementation in ways that better reflect the needs of underrepresented residents of U.S. cities.